One of our investment theses is to look for businesses with very strong core operations and lots of optionality. By optionality, we mean Low-cost mistakes, with known maximum losses, and large potential payoff. 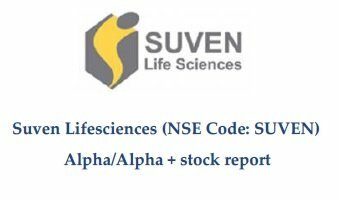 Based on the above theses we initiated a recommendation on Suven Lifesciences (NSE: SUVEN) for our Premium members. The report was initiated around 175 odd levels and in our last update on the company on 16th Feb’19; we had a positive rating around 223 odd levels. Promoted by Mr. Venkat Jasti, Suven is one of the very few companies in India focused on new drug discovery on its own and in partnership with several innovator companies. The Hyderabad based company basically focuses on CRAMS (contract research and manufacturing services) and assists global innovators in drug development by supplying intermediates for relevant new chemical entities (NCEs) during the clinical phase of drug development. The projects undertaken by the Company include process research, custom synthesis and intermediate manufacturing. Since inception the company has worked on more than 750+ projects and is partner of choice for several global innovators like AstraZeneca, Pfizer, Bristol Myers Squibb, JnJ, Merck, Sanofi, Novartis, etc. Besides carrying out research and manufacturing activities for global pharma majors, the company also has a strong focus on its search for new CNS (central nervous system) therapies. It is leveraging its strong research capabilities to develop NCEs in this segment, of which SUVN-502 focused on treatment of moderate Alzheimer is particularly promising. We are looking at Suven from long term investment perspective as drug discovery in itself is a very long cycle. As explained in the business section below, we believe movement of only few projects of the company to higher phases or to commercialization phase can result in substantial increase in sales of the company. Also, while new drug discovery has very low probability of success, more so in the case of CNS, we believe there can be good upside if the company’s SUVN-502 is able to successfully move to Phase III of clinical trials. What is also pleasing to note is that management is not overly promotional of the business and likes to give very conservative guidance. Further, they do not capitalize R&D spends and do not intend to borrow for carrying out clinical trials. At the same time there are a few concerns like, reducing R&D spend by global innovators, revenue concentration with ~40% revenue coming from supply of intermediate to one customer, huge spend on R&D by the company on new drug discovery for CNS and lastly difficulty in assigning a value to NCE business. Disclosure: The above note is for educational purpose and not an investment advice. I have personal investment in the stock and the same has been recommended to clients as well. I have not traded in the stock in the last 30 days. The views expressed are based solely on information available publicly and believed to be true. Investors are advised to independently evaluate the market conditions/risks involved before making any investment decision. A graph of daily closing prices of securities is available at www.bseindia.com (Choose a company from the list on the browser and select the “three years” period in the price chart. The recipients of this report should rely on their own investigations. Ekansh Mittal/Mittal Consulting and/or its affiliates and/or employees may have interests/ positions, financial or otherwise in the securities mentioned in this report. Mittal Consulting has incorporated adequate disclosures in this document. This should, however, not be treated as endorsement of the views expressed in the report.